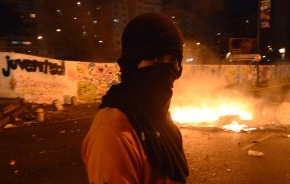 Conditions in Venezuela are reaching boiling point. Venezuelans - particularly students - are taking it to the streets, as protests sparked by worsening living conditions have turned violent (see story). Inadequate supplies of food and medicine are becoming a serious issue. Suppression of free speech by jailing students is adding to protesters' fury. The Maduro administration of course is blaming all this on what they call the "rebirth of neo-Nazi movement" that is trying to orchestrate a coup d'é·tat. The markets have responded as expected. In the "unofficial" currency markets, which Maduro will be shutting down, the dollar is now trading at record premium - 87 bolivars per dollar or some 1,300% above the official exchange rate. The government bond market is having trouble finding bids, as the longer dated bonds now trade above 15.5% in yield - the highest since the financial crisis. Foreign reserves are now at a 10-year low as the government desperately tries to find dollars to keep the government running. Bloomberg: - At least three airlines have grounded flights to and from Venezuela so far this year, in part because the nation's government owed the carriers $3.3 billion in foreign exchange they need to pay operating costs. The government suggested it could pay them with government bonds and cheap fuel, but precious little cash. This should do wonders for getting planes flying again. 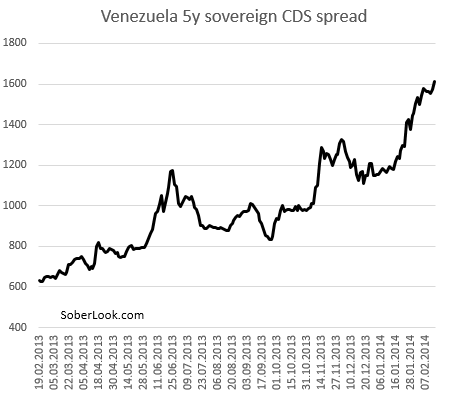 Credit default swaps spreads are moving into "distressed" territory, with the markets increasingly betting on some form of debt restructuring. Years of economic mismanagement and populist/socialist policies (see discussion) are about to come home to roost.